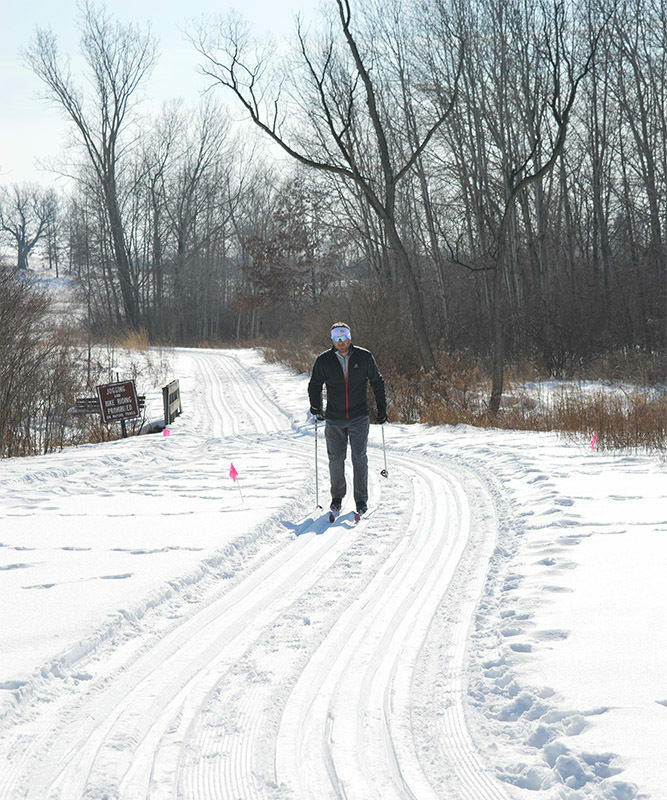 Indian Springs Metropark offers nearly 12 miles of cross country ski trails on three loops that are groomed and tracked for classic skiers. All three loops begin next to the park office that offers parking, restrooms and a warm place to recover after a winter outing. There are some hills and slopes but for the most part skiing at Indian Springs is level and ideal for beginners and intermediate skiers. 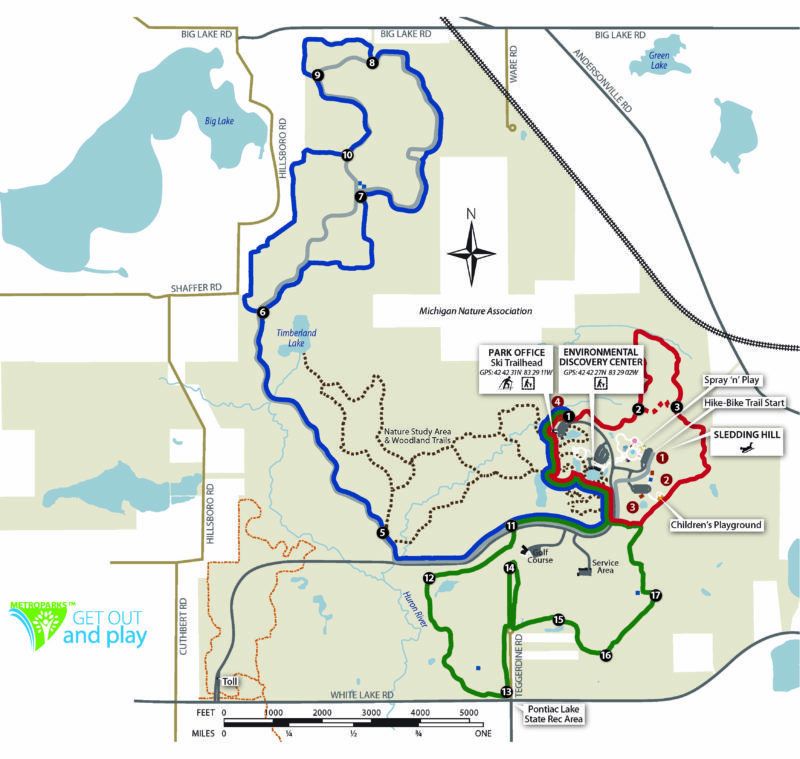 The groomed trails are the 2.5-Mile Loop that incorporates most of the Farmland Trail, the 4.8-Mile Loop that winds across the open terrain of the Indian Spring Golf Course and the 10-Mile Loop that follows the paved Hike-Bike Trail into the Huron Swamp area of the park. The 3.5-mile Woodland Trail, while not groomed, also makes for a scenic and enjoyable ski. There are no ski or snowshoe rentals available at the metropark. During the winter a sledding hill is set up near the North Shelter in the Meadowlark Picnic Area. Other than marked ski trails, skiing is prohibited on the rest of the golf course, especially the greens. Nor are dogs allowed on the trails. 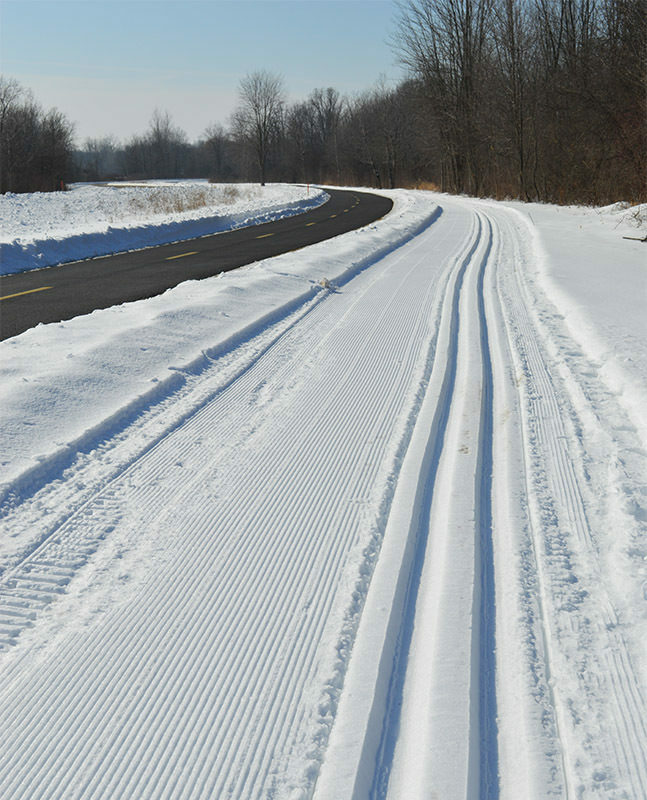 Click Here for a downloadable map of the Indian Springs ski trails. The 4.8-Mile Loop crosses the Park Road at post No. 11 and winds across the open terrain of the Indian Springs Golf Course. The 2.5-Mile Loop features the most change in elevation as it follows the Farmland Trail and then circles back near the Meadowlark Picnic area, skirting the sledding hill at one point, before crossing the Park Road and returning to the ski trailhead. The 10-Mile Loop follows the paved Hike-Bike Trail – but not on it – and in the beginning is in open terrain, most of it close to the Park Road. But within 1.5 miles the loop swings north and enters the low-lying forest where you enjoy skiing through scenic wooded areas and the frozen wetlands of the Huron Swamp before doubling back along the Park Road. 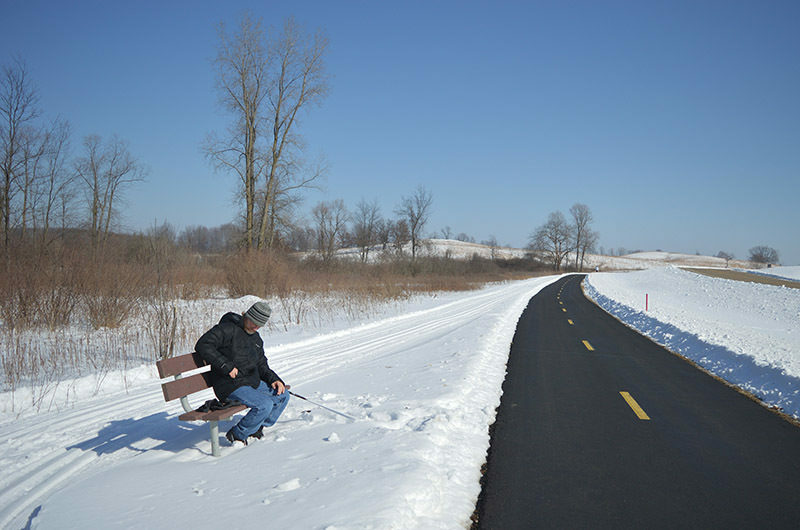 Keep in mind that the Hike-Bike Trail is plowed and open year-round to bikers, inline skaters and roller skiers. Possible slippery or icy conditions makes mountain and fat-tire bikes the best choice for the paved trail in the middle of winter. Perhaps the most scenic route at Indian Springs is Woodland Trail. This 3.5-mile loop is not groomed and often used by snowshoers. But Woodland Trail is popular enough that there is usually skier-set tracks. The trail is a level and easy ski that winds through woods and wetlands to TimberLand Lake before returning to the park office parking area. Three crossover spurs allow you to shorten the outing. During the winter the park office that offers parking, restrooms and serves as something of a warming center for skiers. The Environmental Discovery Center (248-625-7280), Indian Springs nature center, is open year-round from 9 a.m. to 5 p.m. daily. In the winter the park is open from 7 a.m. to 8 p.m. daily. The park office is open 8 a.m. to 4 p.m. daily. There is a vehicle entry fee at Indian Springs. Contact Indian Springs Metropark (248-625-6640; www.metroparks.com) for more information.